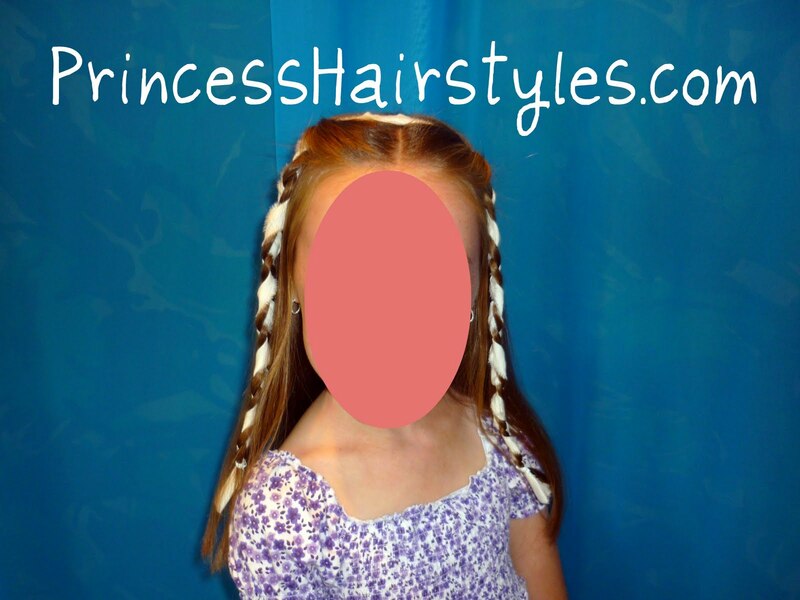 (I apologize for the blurry picture, it's the best I could find of this trendy braided hairstyle while searching Google.) I actually haven't seen much of "Keeping Up With The Kardashians." But, one night I was flipping through the channels and happened upon this cute ribbon braided hairstyle on Kim. Of course, I took a mental note of a hairdo we must try! This hairstyle was shown on an episode where the Kardashian family went to Bora Bora for vacation. 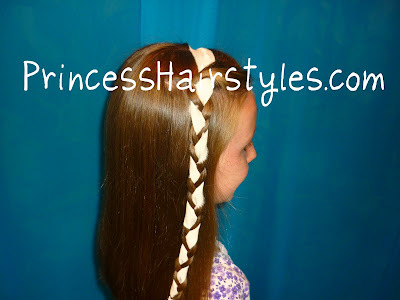 Here are the cute beachy ribbon side braids recreated on our Princess. LOVE! The Princess has naturally pin straight hair and this is how it looks with nothing done to it (air dried after her bath.) Yes, she is lucky! If you have waves or curls, I would just leave them and go with the flow! This is meant to be a quick and easy, no hassle beach style. Btw, I have also seen Kourtney Kardashian and Khloe Kardashian sporting similar hairdos with accents in their braids from time to time. Although I don't know much about them personally, I have to say they are trendsetters and have very cute hair! Very cute! I don't blame you for not wanting to show her face, I wouldn't either! Cute! Funny, I do watch the Kardashians and immediately noticed Kim's hairdo when she wore it like this and wondered how long it would take for someone to post about it, haha. THANKS for sharing. Love it! Beautiful! Can't wait to try this one on my daughter. We recently cut off about 6 inches of her hair but this would totally work even with her shoulder length hair! Thank you! Cute hairstyle! Your daughter's hair has grown so quickly. Could you please show Sierra McCormick's hairstyle in the first episode of A.N.T. Farm,the one that looks like a bun. 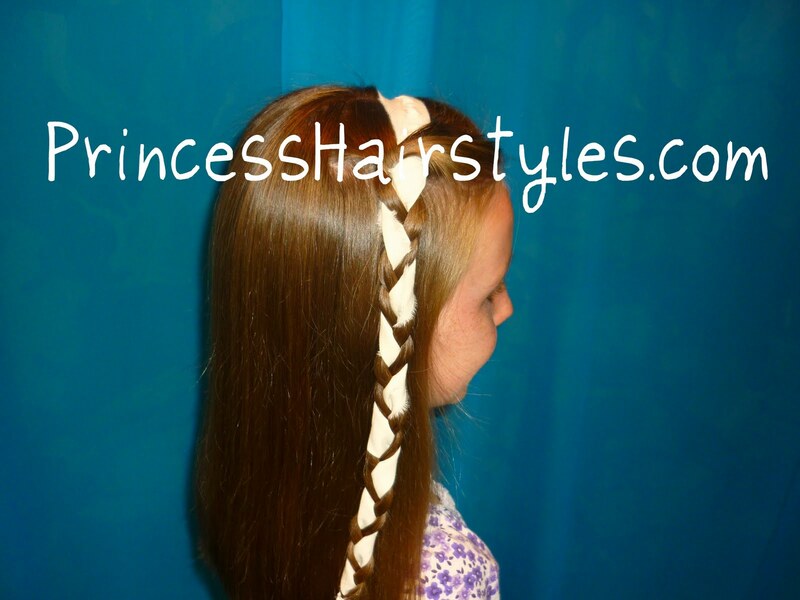 Your daughter looks very cute with the ribbon braid! Thanks for sharing! I totally understand wanting to protect your daughter's privacy! Don't even worry about the pink blob, we get it! This hair style is so cute! 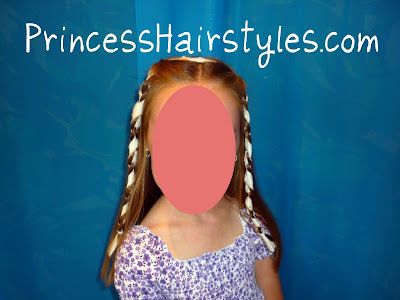 Such a cute hairstyle that's appropriate for kids and adults. On a side note, I don't blame you for blocking her face. Very cute. I need to try that with my daughters hair. Love it. This looks great…she is cuter than KK! CUTE!!! I want to do it on me, but my hair is too short. This is a very cute look that both kids and adults can pull off. Your daughter truly live up to her name. "Princess"
You really copied Kim's hairstyle. Wow I am really amaze with your works. Fantastic talent. Keep it up and don't ever lost it. Since this hairstyle is very quick and easy, I was able to do it for most of the girls in my schools fall play. We did As You Like It and they looked very period appropriate.